This muffinized™ piña colada is full of the flavors of pineapple and coconut, without the rum. Adding pineapple also intensifies sweetness without adding additional sugar. Out of the oven, the scent is wonderful in these almost-cupcakes that contain no butter or oil. 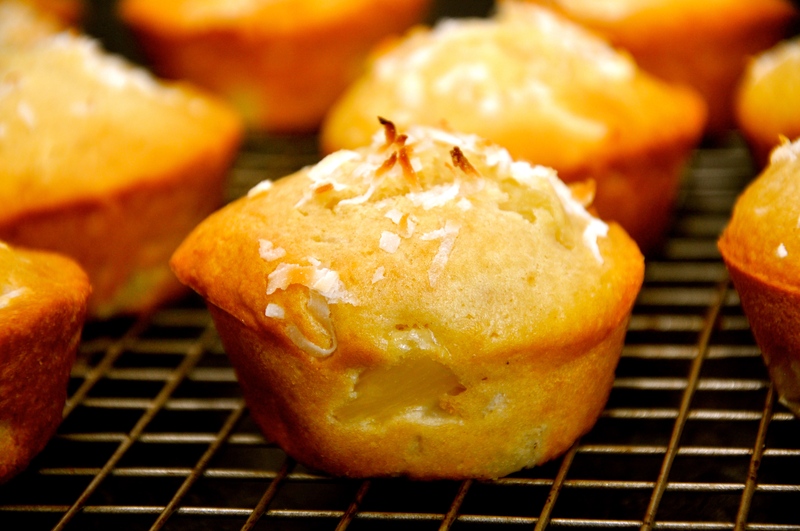 Fresh and light, this muffin is dense and yummy. There are bits of pineapple in each bite, and the flavor is reminiscent of a macaroon. 1. Preheat the oven to 400 degrees. Grease muffin pan with cooking spray or line with paper liners. 2. In a large mixing bowl, stir together flour, sugar, baking powder, baking soda, and salt. 3. In a separate bowl (or a liquid measuring cup), combine coconut milk, applesauce, and vanilla. 4. Make a well in the dry ingredients, add the wet ingredients, and stir just to combine. 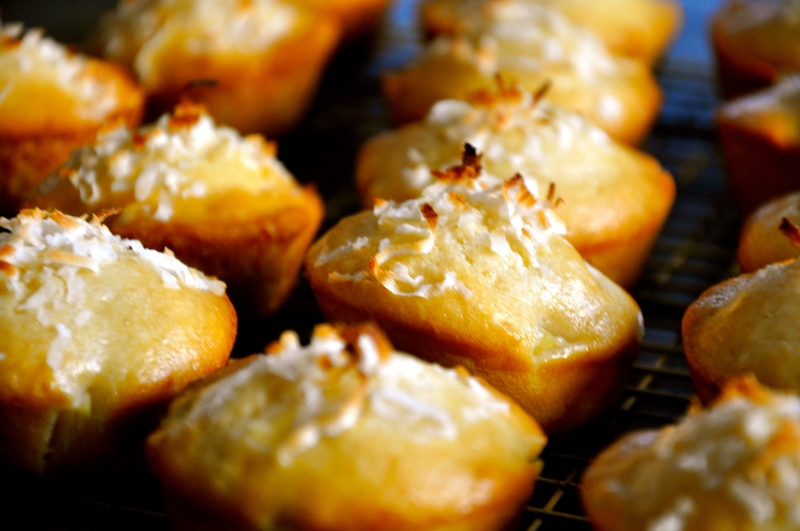 Fold in the ½ cup shredded coconut and pineapple. 5. Spoon batter into greased muffin pan, filling each muffin cup about 2/3 full. Sprinkle additional shredded coconut on top. 6. Bake for 15 minutes and allow to cool before removing muffins from tin. “What on earth is that?” 5-year-old Michael asked. I’m sorry, Michael, for not exposing you sooner. 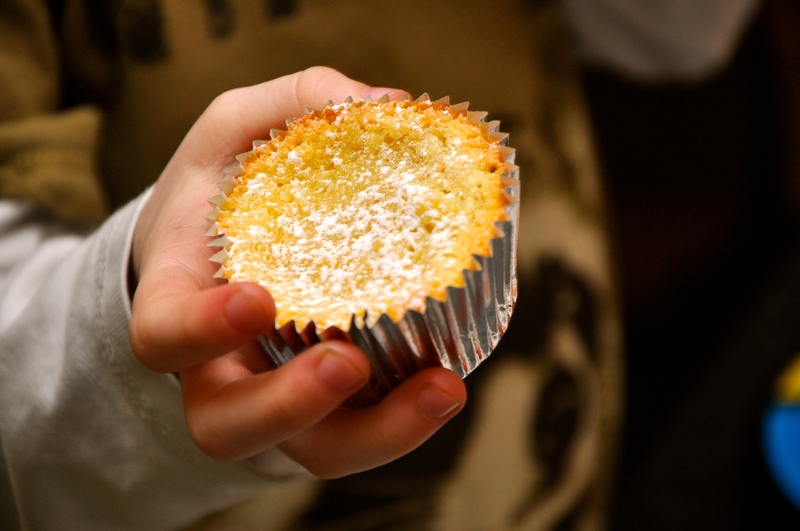 But here it is in muffin form, a childhood classic. 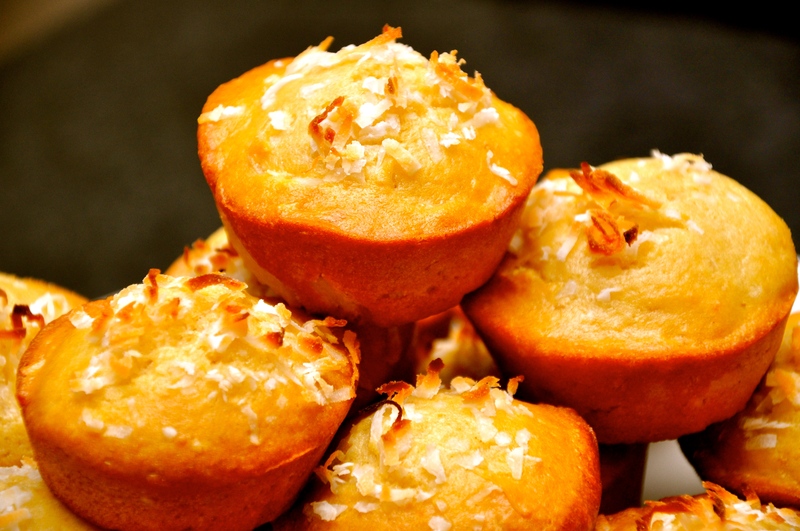 These muffins are dense like fudge but as light and refreshing as a cold glass of orange juice. The orange flavors of orange juice and zest with creamy white chocolate chips makes a delicious combination. 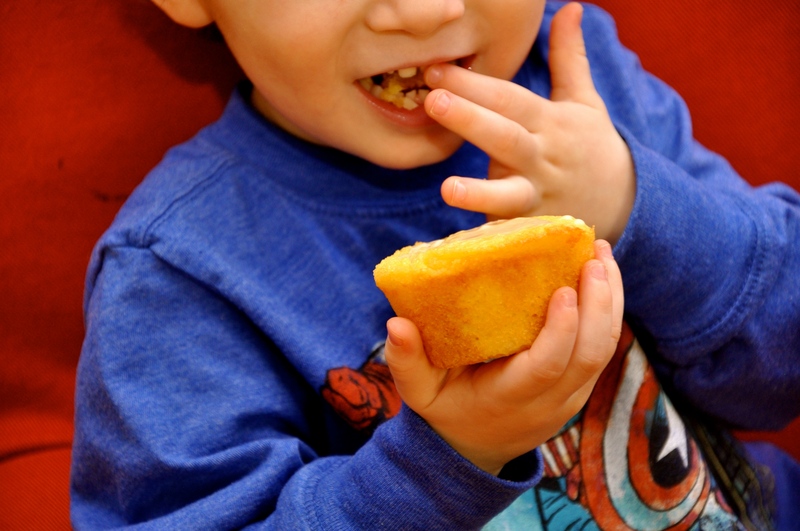 Serve for breakfast, snack, or dessert and remember how sweet it is to be a kid. 1.Preheat oven to 350 F. Grease muffin pan with cooking spray or line with paper liners. 2. In a large mixing bowl, combine flour, sugar/orange zest mixture, baking powder, and salt. 3. In a separate mixing bowl, whisk together orange juice, heavy cream, egg, and oil. 4. Pour wet ingredients over the dry mix. Stir until just combined. Fold in white chocolate chips. 5. 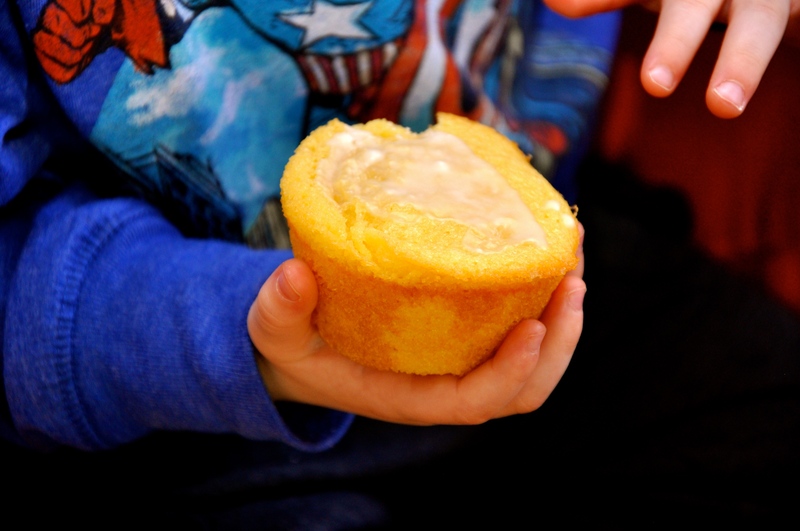 With an ice cream scoop, fill muffin cups 2/3 full. 6. 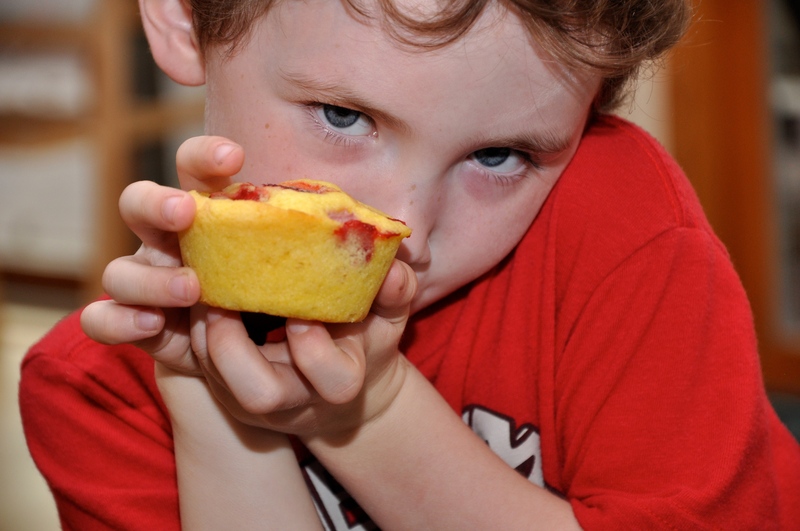 Bake for 18 to 20 minutes or until a knife inserted in the center of a muffin comes out clean. 7. Let cool in pan for 5 minutes before removing to a cooling wire rack. Vibrant like sunshine. Distinct citrus flavor. Not a hint of sourness. 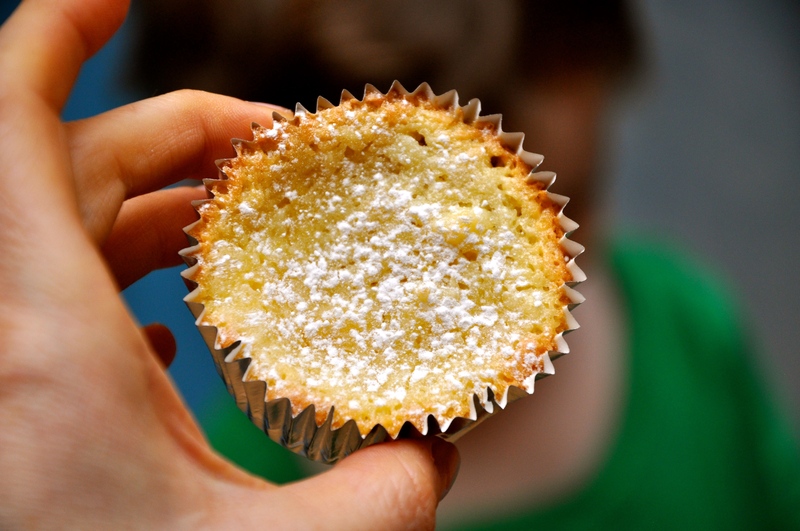 Lemony muffins are super moist, fluffy yet dense. The delicious glaze adds texture and sweetness to the unmistakably lemonylicious dessert-snack-breakfast. 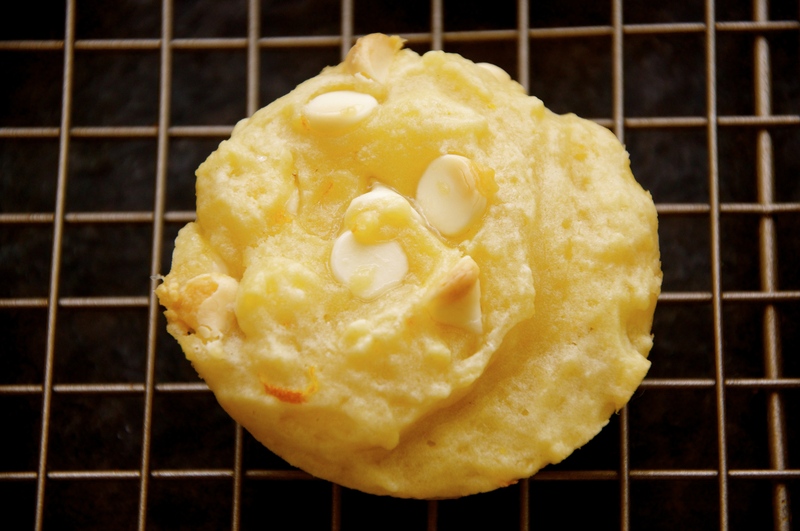 The color of these muffins is a natural yellow, so brilliant. As pleasing to the eye as they are to the palate, these gorgeous muffins make a sweet treat for whatever occasion. 1. Preheat your oven to 350 F. Grease muffin pans with cooking spray. 2. In a large mixing bowl, combine flour, baking powder, baking soda, and salt. Mix well. 3. In a separate mixing bowl, combine eggs, vanilla extract, lemon extract, sugar, butter, lemon juice, and oil. 5. Add the lemon zest and mix again. 6. Spoon batter into muffin cups, to ¾ full. 8. Bake for 20 minutes until a knife inserted in the center of a muffin comes out clean and the edges are just browned. 9. While muffins are baking, whisk together glaze ingredients. Let glaze stand to thicken. 10. 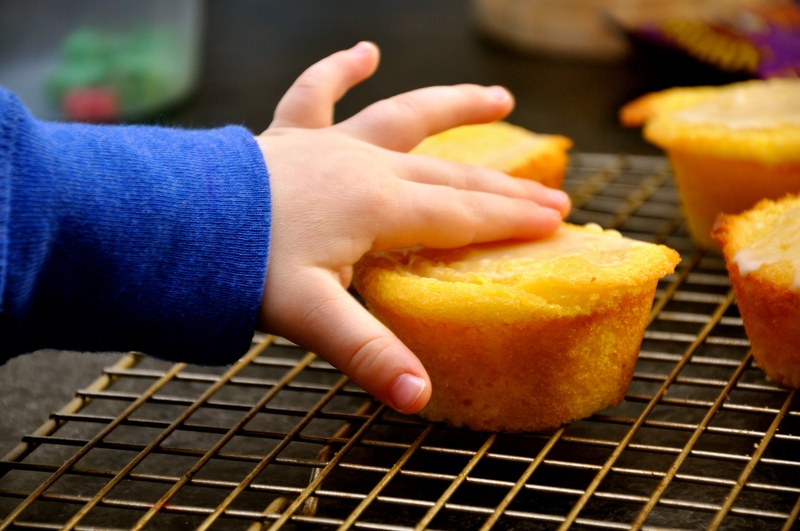 Allow muffins to cool for 5 minutes before transferring them to a wire cooling rack. 11. 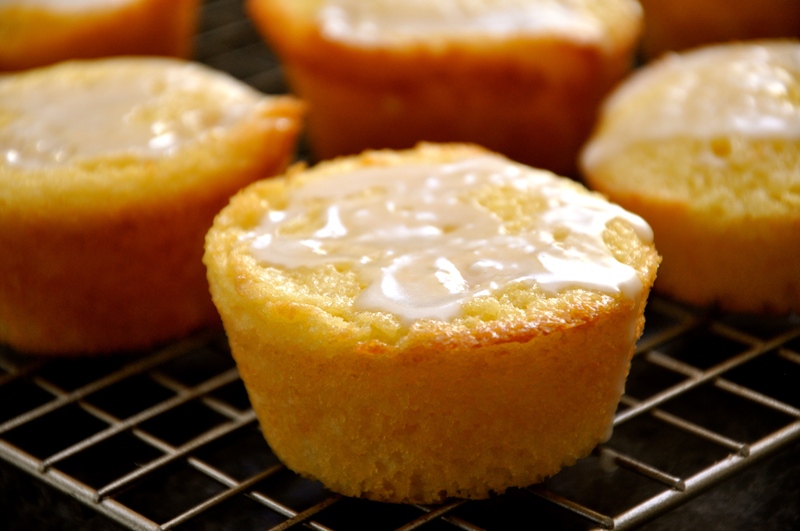 Pour, drizzle, or spoon glaze on muffin tops. Luscious and dainty, these cheesecake muffins are dusted with powdered sugar, inspired by the delicate dance of the Sugar Plum Fairy. 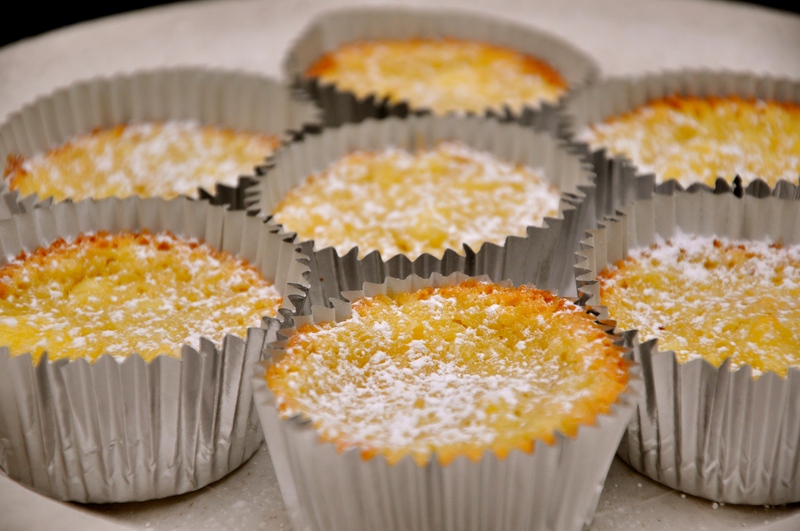 Their sweet taste is tinged with a cheese-cake-y tang that is out-of-this-world. The vanilla extract and wafer cookie crust send a hint of caramel right to the heart of the cakes. And the bottoms are not soggy! Rich and creamy, this great dinner party dessert is perfect for any season. The sprinkled powdered sugar on top suggests an edible winter wonderland. The velvety-smooth cream cheese makes a platter ideal for spring and summer and any holiday that highlights dairy foods. These beautiful cakes are light but dense with flavor. 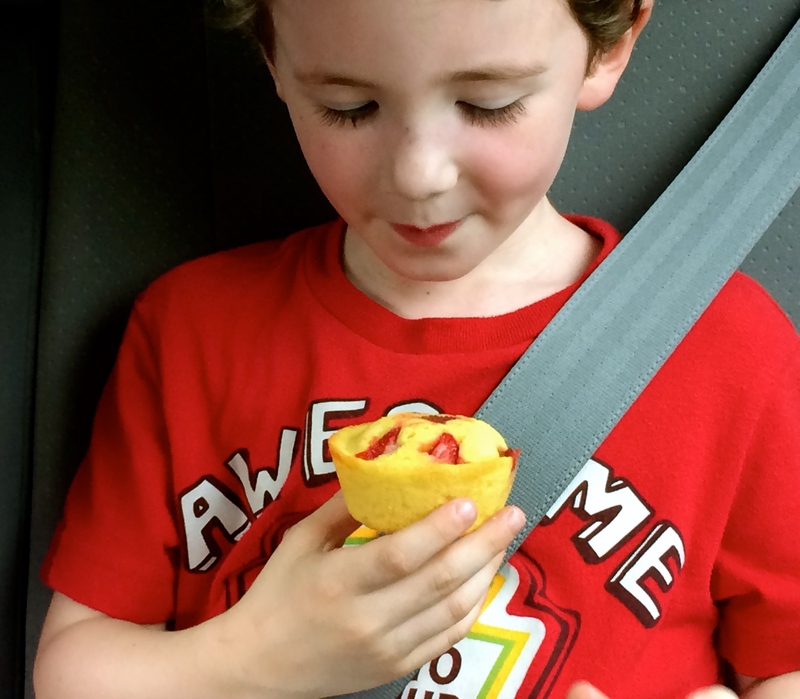 They are sized just right for the calorie conscious and baked in small cups for little hands. The best part of this recipe is that it’s so easy and effortless while still creating the illusion that a pastry chef has spent hours in the kitchen. 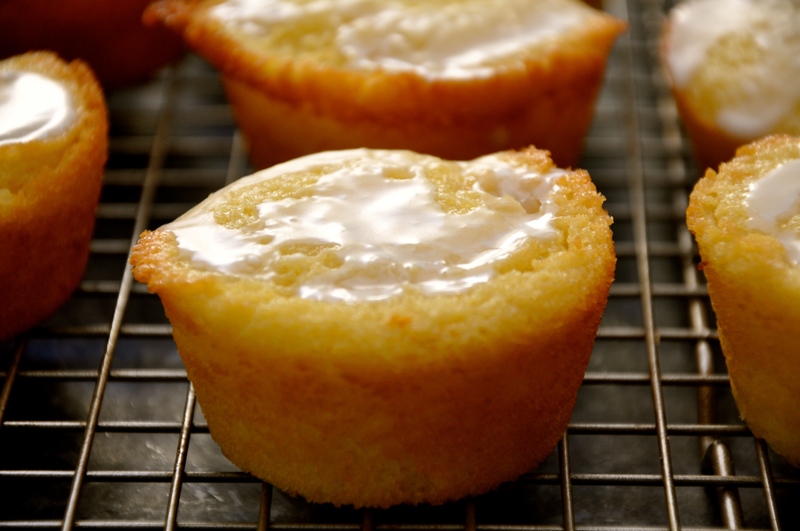 For a taste of New York, make cheesecake muffins ahead of time and serve, any time of the day. 1. Preheat oven to 375 F. Spray muffin pan with cooking spray or line it with paper liners and spray liners. 2. In a large bowl beat cream cheese and sugar. Add in flour and baking powder and beat until combined. Then mix in eggs, one at a time, lemon juice, and vanilla. 3. Fill a muffin pan with cupcake liners and place two vanilla wafer cookies at the bottom of each one. Divide batter between 12 liners, filling each cup up to about 1/4 inch from the top. 4. Bake for 22-25 minutes or until a toothpick comes out clean. 5. 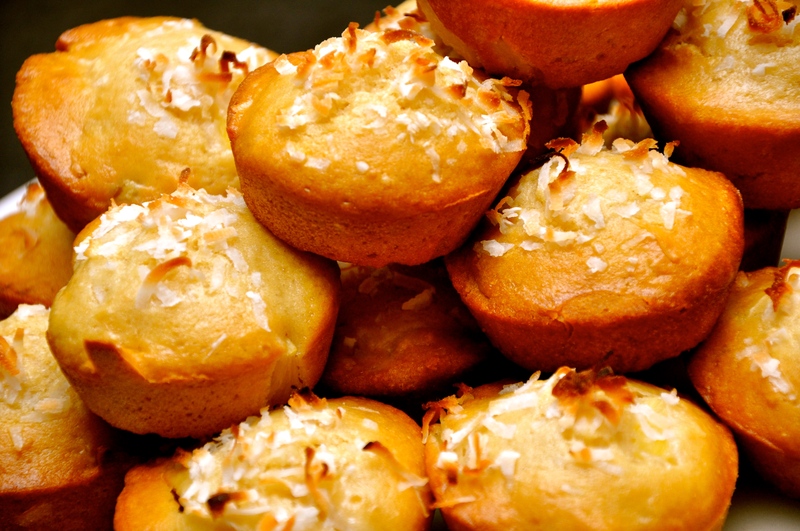 Remove muffins from oven and place them on a cooling rack to cool completely. 6. Chill in refrigerator for two to four hours. 7. Top with powdered sugar and serve. This article was featured in Real Woman on December 3, 2014. Brrrr, it’s cold outside, baby. Warm up with the summery goodness of these tasty treats, which will heat you up from the inside out. At about the 18-month mark, my first-born son, Michael seemed to have a non-verbal revelation that manifested like this:I’m no baby! Stop feeding me like one. (And by the way, Mom, I don’t need you. P.S. I hate baby spoons!) I was shocked (and shattered) when he pushed the baby food away for the first time. Once I got over the initial rejection, I had my own kind of revelation: Get a grip, your little boy is growing up—you’ll have to adjust. With a knot in my stomach and banana mush in my hair, I couldn’t help but wonder what I was going to feed him. As if that first declaration of independence wasn’t enough of a bombshell, one Tuesday morning, Michael woke up at 4:30 a.m. (with a huge grin). The next day, he did it again. I kept telling myself it was a phase, as I continued to scoop him out of his crib every day at that pre-dawn hour. I hate that time of day. Did I mention that I was already sleep deprived? And then I discovered something that worked. Baking muffins became our new game. We bonded. We shared. Michael delighted in watching the muffins grow, not to mention eating the finished product. And 4:30 a.m. became more fun for me, for my little alarm clock—for us. Lesson learned. 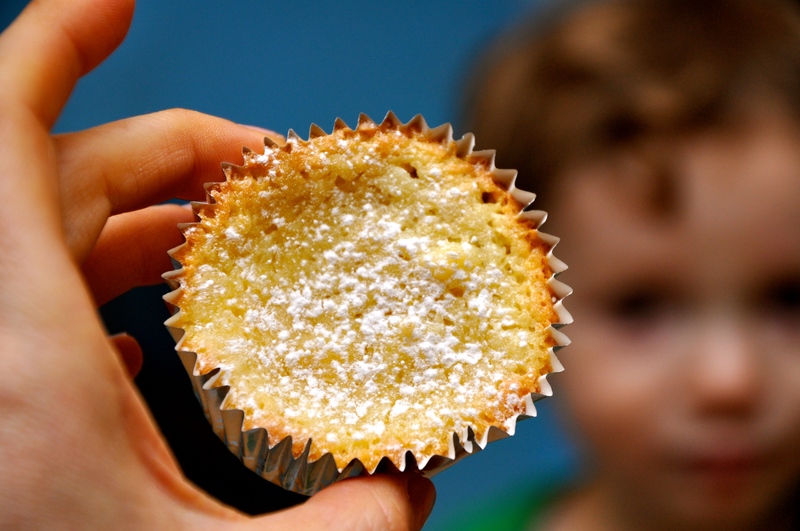 When given a lemon, make lemonade….or lemonade muffins. 1. Preheat oven to 350 F. Grease muffin pan with cooking spray or line it with paper liners. 2. In a large mixing bowl, whisk flour, baking powder, sugar, and salt. 3. In a separate mixing bowl, mix butter, eggs, vanilla, and milk. 4. Pour wet ingredients over the dry ingredients. Stir. 5. Fold in the lemon juice and lemon zest. 6. Spoon batter into greased muffin pan, filling each muffin cup about 2/3 full. 7. 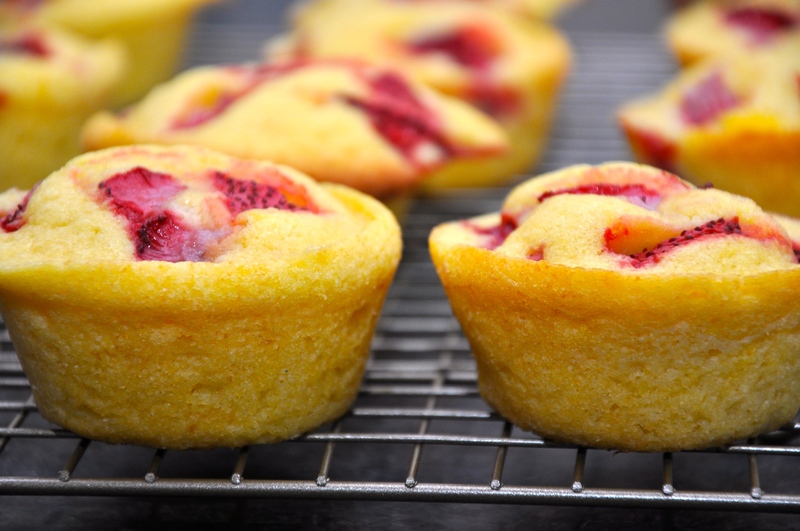 Sprinkle tops of muffins with chopped strawberries. Prod into batter. 8. Bake for 4 minutes at 400 (this helps muffins to rise), then turn oven down to 350 degrees and bake for another 16 minutes, or until a toothpick inserted into the center of a muffin comes out clean. 9. 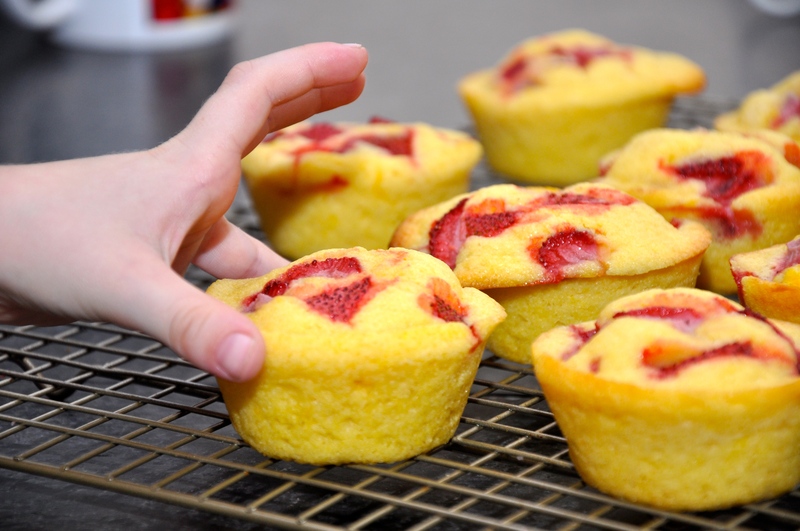 Allow muffins to cool in the muffin pan for 10 minutes, then remove to a cooling rack. These bright yellow, hot pink speckled, Strawberry Lemonade Muffins are candy for the eyes. They don’t spill! And they contain some protein from the eggs and milk. 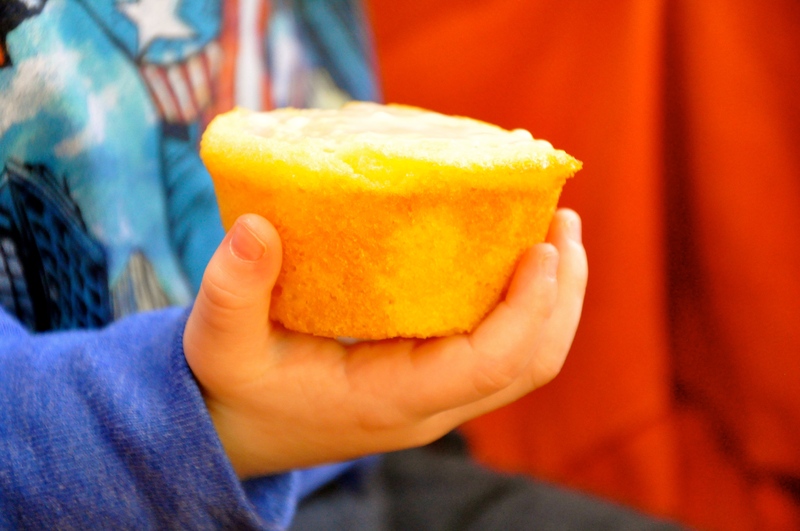 The color of these muffins is a natural yellow, so brilliant that it will bring smiles and brighten your day. The flavor is buttery lemon with moist strawberry topping, which makes them as refreshing as the original strawberry lemonade beverage. Not the time to teach your children to share! Simply enjoy.